After three consecutive years of overloaded agendas leading to a WSFS Business Meeting being held on the final day of Worldcon, normal service has been restored, and the Sunday Business Meeting was able to handle all Site Selection business and also some additional WSFS business before adjourning sine die (without date, ending this year's meetings). The Sunday meeting was actually two meetings: the Site Selection meeting, where the convention formally receives the results of the election, and the consideration of any remaining WSFS business. Today the headline event was probably the receipt of the 2020 Worldcon Site Selection results. To no one's surprise, New Zealand, running unopposed, won. Earlier, Site Selection Administrator Warren Buff read out the results of the 2019 NASFiC election (Utah, also running unopposed, won their election as well) followed by the 2020 Worldcon election. I helped things along by moving to thank the tellers and order the ballots destroyed. The adoption of that motion is the procedural point where the election is beyond dispute and official. It's equivalent to the OFFICIAL sign going up at a horse race, and we "pay the tickets" by turning over the money and voter information to the winning bids. More details about the results are available in Issue 7 of the Worldcon 76 newsletter, The Tower. The full breakdown showing votes by day and in advance, will be available in the Business Meeting minutes later. After New Zealand won, a bunch of members of their committee came up to the front of the room, and they played an introductory video, including an effusive welcome from Jacinda Ardern, the prime minister of New Zealand! And here I was excited that the Mayor of Winnipeg came to open the 1994 Worldcon. That's got to be the highest-ranking politician to ever take notice of our convention. George R.R. 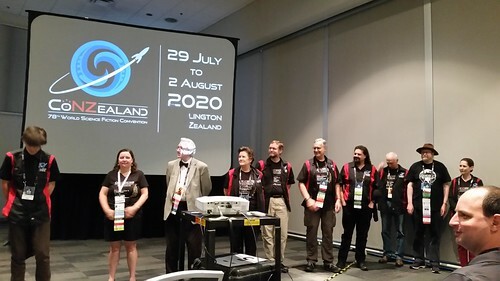 Martin will be the convention Master of Ceremonies, and he appeared before the Business Meeting (not the first time he's addressed that body) to offer some nice things about New Zealand and the newly-seated Worldcon committee. I'm afraid I didn't get any pictures of the NASFiC kick-off, and by the time I remembered to do so, the committee had left to start selling memberships. 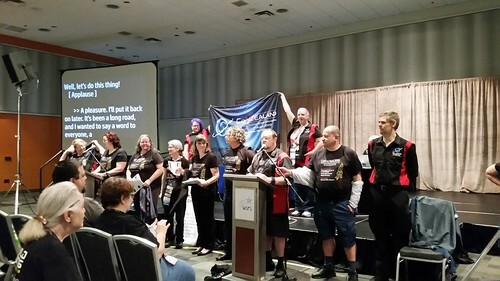 After Site Selection, we had Question Time for Dublin 2019, followed by short presentations from the DC in 2021 and Chicago in 2022 Worldcon bids. Then we recessed for a few minutes to allow those people only interested in Site Selection business to leave. There were still a couple of pieces of substantive business to consider, and I'm afraid that we got into a classic case of business expanding to fill available time. The summary was that both proposals were referred to committees to revisit the proposals and come up with better wording for next year. But getting there required a trip through the parliamentary long grass. 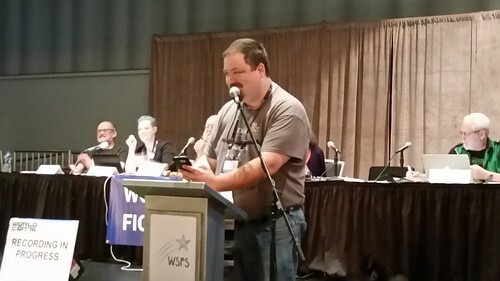 The first proposal had to do with the rules about when WSFS convention committees (Worldcons and NASFiCs) have to produce financial reports. This was a late proposal allowed onto the agenda, but it unfortunately showed, and rather than try to work out details of changes to clean it up on the floor, the proposal was referred to the Nitpicking & Flyspecking Committee with instructions to consult with the makers to come up with something that accomplishes what they want without any undesired effects. The second proposal was the set of changes to the Professional and Fan Artist Hugo Award categories. For both personal and procedural reasons, Business Meeting Chair Tim Illingworth proposed that the meeting go into Committee of the Whole (which relaxes some of the debate-time rules), putting Jesi Lipp back in charge of the meeting while Tim went off to handle a personal issue. This is how Jared Dashoff got his first experience as the WSFS presiding officer, but in that case Jared had some warning that it was going to happen. Jesi got thrown in at the deep end, and in my opinion they did as well as could be expected under the circumstances. Unfortunately, the issues were complex, and it's really difficult to craft complex changes on the fly. Then we got into the parliamentary weeds when the debate time limit imposed by the way in which we went into COTW caught up to us. I offered the procedural way out of that, which sounds complex but is really very simple: The COTW "rises and reports that they need more time to consider the issue," the main meeting (which really is the same people) extended the debate time, then resolved itself back into COTW. I heard at least one experienced parliamentarian in the membership groan over this, but as I expected, it really didn't take long, while all of the "shortcuts" would have taken longer. I thanked Jesi later for letting me try that method. In the end, this complex proposal had a motion applied to send it to the Hugo Awards Study Committee (which had originally drafted it). This led to the relatively rare case of someone moving to amend the motion to commit by striking out "Hugo Awards Study Committee" with "a special committee to consider only this proposal and to be appointed by the Chair." Mind you, the people making the motions weren't so clear-cut on what they were asking, so we had to thrash around for a while to figure out that this is what they wanted. Then there was confusion about what we were actually voting on, and the vote itself was so close that we had to do a serpentine vote to determine that the preferred solution would be a special committee. After picking that committee, the actual vote to refer to that committee was nearly unanimous. One final complex matter was a proposal that the Business Meeting direct its officers to write a letter to the Ursula K. LeGuin Estate regarding the matter of the Lodestar award. After a great deal of debate and further procedural wrangling, the meeting voted down the proposal. The most telling argument against doing so appeared to me to be that the Business Meeting is not responsible for the actions of individual members of WSFS, and generally should not take official notice of those actions. The final motion was to adjourn sine die ("without date," which ends the entire series of meetings for the year) in memory of Anna Moffat and Milt Stevens, both past Worldcon chairs who passed away in the past year. We adjourned just in time to give enough time to rearrange things to do the Worldcon Chairs Photo Session. Unfortunately, the way we did so required Lisa to take the video camera off its tripod and disconnect it from the house audio. The affected both the stability of the video and the audio levels. I had to boost the audio within Premier, then run the resulting video through another converter to boost the audio and additional 500% before it was properly audible. Here's the video of us calling off our names. Photos are on a different camera and I've not had time to upload them yet. And with that, we were done with the Business Meeting for 2018. Lisa and Scott packed the camera gear, and we moved everything back to the hotel room. We met up with Linda Deneroff and made for the exhibit hall and lunch. The food there isn't that exciting, but service is fast, and there are lots of tables, and we could socialize not only among ourselves, but with the other fans coming through. I told Lisa to take the rest of the day off. I, however spent much of the afternoon up in the hotel room converting the videos she shot today to make the higher-quality video of the Business Meeting and getting them set up to upload while we have enough bandwidth to push the large files online. 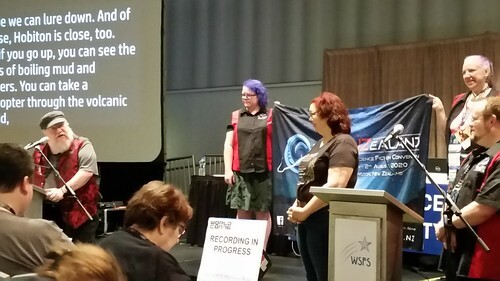 The three days of WSFS Business Meeting are now online in six segments on the Worldcon Events 2018 WSFS Business Meeting (Higher Quality) playlist.